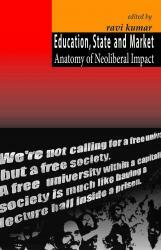 Ravi Kumar‘s new book Education, State and Market: Anatomy of Neoliberal Impact published by Aakar Books (Delhi) is the first volume to comprehensively examine the impact of neoliberal capitalism on education in India. Kumar is a professor in the Department of Sociology at the University of South Asia, in Delhi. He blogs here and is also part of the editorial collective at Radical Notes. The book presents a set of papers that illuminate in profound ways how the wide-angle historical frames provided by Marxist analysis facilitate our understanding of the details embedded in national and more local educational contexts. Neoliberalism attacks human dignity. The consequences of social, economic, and educational policies that exacerbate inequality, magnify exploitation, and undermine personal and social freedoms are clearly analyzed by each of the contributors. The circumstances are dire and readers will most certainly be outraged as they learn how neoliberal policies and practices reduce the process of education to a commodity and teachers and learners to elements in formula for the relentless production of profit. This volume presents a clear and compelling analysis of how neoliberal thought and practice has transformed education at the policy level in India and in the process distorted the official aims of education as well as social relations among teachers and learners. Most importantly, however, these chapters provide insights into how we might channel our rage against neoliberal capitalist mechanisms into the creation of new visions of resistance to educational practices that privilege profits over people. Editor Ravi Kumar has assembled the finest scholarship to investigate key questions in regard to the relationship of the development of modern capitalism, its connections to empire, the role of the state, and the resulting impact on education. The essays within go to the core: what is valued as “knowledge” now? Who shall schools serve? Indeed: Why have school? The critical reader will find new questions, and profound answers. where they can share their experience about the inner city blues. the students on an educational death roll. and not just the ones trying to do the black community a couple of favors. An excerpt of Rachel Smith’s powerful poem opens the article and this gives you a sense of where Vellanki is headed with this analysis, which focuses on two issues. First, he examines “the teacher preparation programme adopted by TFI, highlighting the influence of the Western counterparts and the disjuncture that this creates with local contexts, policy initiatives and curricular frameworks.” You won’t be surprised to find the program is judged inadequate. And, in terms of the fledging Teach for Canada, which apparently is now focusing on First Nations education and schools in the northern territories (as opposed to TFA’s focus on urban schools in the USA), Vellanki’s critique of TFI’s colonialist approach is crucially important and applies, albeit in differing ways to Teach for America, as Rachel Smith makes clear, and for Teach for Canada. Secondly, Vellanki unravels the advocacy networks within which these programs (TFI/TFA) locate themselves, and examines at the education reform agenda they are pursuing, both locally and globally, which are, if you know anything about TFA, based upon neoliberal capitalist tenets (e.g., so-called public private partnership models aimed at privatizing public education or at least extracting private profits from funding for public education). 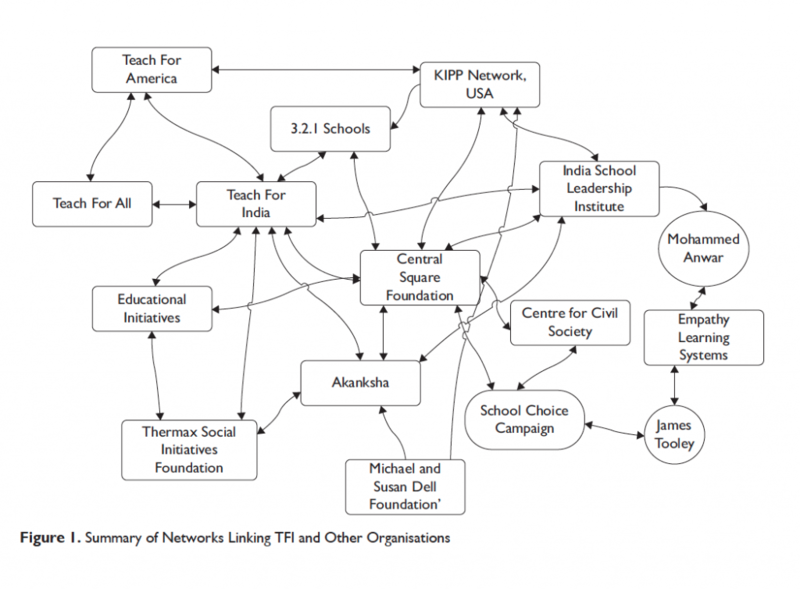 Vellanki’s work on the TFI/TFA network is illuminating and echoes similar analyses of corporate and philanthropic connections that are shaping education reform in North America (see, for example, the work of Kenneth Saltman).